Home sweet home, Mars style? NASA has crowned three design teams as finalists in its ongoing competition to design 3D-printed habitats for Mars, giving earthlings a glimpse of what it might look like to live on another world. The goal of the competition was "to create housing solutions for our explorers on the moon, Mars or beyond," Monsi Roman, manager of NASA's Centennial Challenges Program at the Marshall Space Flight Center in Huntsville, Alabama, said in an email. The $100,000 prize money was shared by SEArch /Apis Cor of New York City; Zopherus of Rogers, Arkansas; and New Haven, Connecticut-based Mars Incubator. The competition required the teams to design habitats that could withstand the intense radiation, extreme temperature shifts and thin atmosphere on Mars. And the habitats had to be designed so that they could be built via 3D printing, which turns digital blueprints into structures by laying down successive layers of plastic or other materials — in this case, rock gathered locally as well as garbage generated by astronauts. A 3D printer could be sent to Mars to build a habitat before astronauts even touch down, meaning astronauts would have a place to live as soon as they arrived planet-side. If the habitat sustained damage, the astronauts or controllers back on Earth could instruct the printer to quickly fabricate the required replacement part. First-place finalist SEArch /Apis Cor (seen at top) opted for tall structures with gently sloping sides and heavy roofs. Outer walls made from the Mars rock known as regolith help shield against radiation, as do specially angled overhangs on the windows. The brightly lit interior spaces — crew quarters, lab space and a kitchen — are all independently connected to life support systems to keep astronauts safe in case of emergency. And a vertical garden fills the habitat's inner walls with greenery. Team Zopherus, which took second place, designed a series of small huts with domed tops. In these structures, the regolith is sandwiched between an inner layer of insulating plastic and a crosshatched outer layer to reinforce the concrete and deflect radiation. A moving shield protects the huts from direct sunlight, reducing the strain on the concrete caused by temperature shifts. The walls of the communal space are lined with cubbies and shelves of hydroponic plants, and a large bay window allows astronauts to supervise the operation of uncrewed rovers. 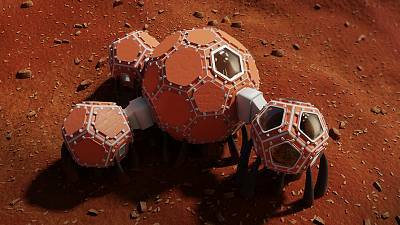 Third-place winner Mars Incubator's design centers upon a large soccer ball-shaped structure on legs made of basalt, a volcanic rock found in Mars's crust. Three smaller soccer ball structures connect to the main hub through adjustable bridges. The modular panels that form the soccer balls are made of regolith and plastic reinforced with basalt fibers. Inside, it's spartan, but one compartment is devoted to a lush garden. How closely will these habitats resemble the habitats that one day almost certainly will be built on Mars? It's unclear, says Jim Zimbelman, a planetary geologist at the National Air and Space Museum in Washington. 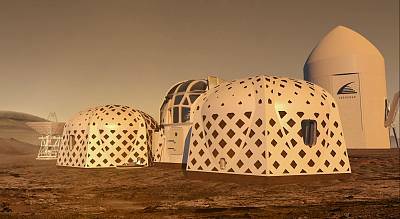 Stephen Petranek, author of "How We'll Live on Mars," believes the first Martian structures will be built underground or in caves to protect from radiation. But Petranek and Zimbelman agree that competitions like this are crucial for finding new ways of building in space. The finalists will go head-to-head next month in the final round of the competition, building small-scale versions of their habitats in hopes of winning the $800,000 grand prize.